The New York Magpies and other organisers of the Australia Day longest kick competition, featuring NY Jet and ex-Geelong AFL player Ben Graham, have released further information on the locations and details of their contest. The AFLPNG will this year send three junior teams on tour to Australia, with a boys under 16s squad touring in April, an under 16s girls team playing in the North Queensland challenge in Cairns in October and some of the boys under 14s competing at the Queensland Country Championships in June. On Sunday I took my son to his first AFL game. As we played kick-to-kick behind the temporary bleachers, memories flooded back of playing footy with my dad and brother at Princes Park after the game. Japanese import for the Bendigo Bombers? Melbourne daily newspaper the Herald Sun reported on January 16th AFL club Essendon are considering sending one of the Japanese players training with them over summer to its VFL feeder team, the Bendigo Bombers. The Swans versus Kangaroos AFL match at Los Angeles last weekend was a long overdue return to the US for Australia's top sporting organisation. After years of lobbying and aborted attempts, the event finally happened. With so much to organise and all involved relatively new to such a task (given the AFL's long absence from North America), it was inevitable that not all would go smoothly. But critically the game was held, the AFL clubs appear to be pleased with the outcome and no major injuries were sustained - always handy when hoping to make it an annual event. worldfootynews.com has received feedback from someone active in the USFooty community expressing concern about some of the personal comment in the story Hollywood encounter with the Swans and the Kangaroos is no B-grade movie. The issue related to content at the end of the story primarily regarding previous administration of the game in the US. WFN welcomes such feedback and appreciates the concern. The article was submitted by an independent contributor and as such does not necessarily represent the views of WFN. Melbourne daily newspaper The Age today reported that a development squad of 22 young Australian Aboriginal footballers would tour South Africa next month, under the leadership of indigenous AFL stars Adam Goodes and Michael Long. The squad will leave on February 19, spending two weeks visiting black communities in the North West Province and playing three matches. 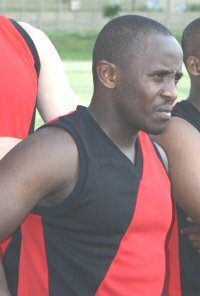 New South African coach Mtutu Hlomela (pictured) was a strong player for the Buffaloes at the 2005 International Cup and afterwards stayed on to learn about AFL operations. He also toured other states, building up relationships in the Australian Football community. During Mtutu's stay the concept of an Aboriginal tour was worked out and it is tremendous news that it is occurring so quickly. Ben Graham, punter for the New York Jets and former long-kicking defender for the AFL's Geelong Cats, has been confirmed as an attendee of the New York Magpies' Longest Kick competition, an annual Australia Day social event and fundraiser for the Aussie Rules community in the Big Apple. The Aussie All comers team has defeated the US Revolution team by 37 points at the UCLA today on a playing surface roughly the same size as the SCG. The match was played in front of a sell out crowd, as the curtain raiser to the Sydney V Kangaroos exhibition match, which the Kangaroos won by 48 points. Australian celebrities joined the the capacity crowd including, Olivia Newtown-John, Layne Beachley and Hugh Jackman. Australian Federal Treasurer Peter Costello, and former politicians John Olsen and Tim Fischer were also present. Match reports to follow as they come in. Photos of the Aussie All-comers side added courtesy of Mark McParland. In the lead-up to this weekend's exhibition match between Sydney and the Kangaroos in LA, a training session was held for USAFL players with members of the AFL teams and dignitaries from the world of footy such as Ron Barassi - introduced to the American audience as being the "Vince Lombardi of Australian Football". Michael “Scuba” Russell reports for us from UCLA. Alan Johnson is the Managing Director of the Ramada Inn in West Hollywood. He has strong links with the Australian Expat community in L.A. and with the North Melbourne Kangaroos as the ex-Chairman of the North Melbourne Football Club. His drive to make an AFL exhibition game happen as part of the Australia Week 2006 festivities will see Hollywood play host to AFL and USAFL football followed by a week long salute to Australia's other fine exports including the arts, food and wine, fashion. The local support is stong and it appears that the match will be a sell out. Here we preview the event and talk to first-time US coach Tom Ellis. Disclaimer: The opinions in this piece are those of the author and do not necessarily represent the views of the USAFL, its board, its member clubs or WFN. While it is all well and good to say that developing footy internationally is important or to say the U.S. is an important market for talent and supporters, developing footy in the U.S. takes money. How much money? Does the AFL need to bear the burden of the funding? Is USFooty self-sustaining?